The long wait for the World Cup of Hockey’s return is almost over and I can’t wait to see the event back on the ice next fall. There is some contention over the choice to include a pair of teams who aren’t connected to any one country. The European All Stars, made up of players from countries not named Sweden, Finland, Russia or the Czech Republic, and the North American Young Stars teams will allow the league to showcase more star talent in the short tournament. The two teams have drawn the ire of some, particularly the Young Stars team which will pull American and Canadian players under the age of 23. While Team Europe’s melting pot roster will be star-studded, the team isn’t pulling talent from other nations participating in the tournament. The same cannot be said of the North American Young Stars who will likely wind up with three or four players who would have otherwise suited up for the Americans alone. I, for one, love the idea of the Young Stars team. As this isn’t the Olympics and there still doesn’t appear to be a long-term answer for the structure and schedule of the tournament, there’s no reason not to introduce a new wrinkle or two to help put more star power into the games. Each time the Olympics come around there’s discussion over how good a second Canadian squad would be. This practice isn’t far off from giving the Canadians another entry, there just happens to be a few Americans sprinkled in. As I am probably unreasonably excited about the Young Stars team, I took the time to peruse the NHL player database to determine who will wind up on the squad. The rules for the Young Stars team specifies that players must be born earlier than October 1, 1992 to qualify. They also have to be American or Canadian, in case you were wondering. My attempt at the roster isn’t done with any bearing on lines or pairings although I took the potential role some players would fill into account. The biggest question mark for the Young Stars team will be in net. At the moment there aren’t any every-night starters in the NHL who fall under the age limit although there are a few rising stars who could certainly see their crease share grow in the coming months. Probably the most common name that will be listed on roster projections for the Young Stars team. He starred for the US at the World Juniors and is seen as the cornerstone in goal for the Ducks moving forward. He hasn’t established himself as a full-time NHL netminder just yet, but he’s getting close. Another name that will be a popular pick on projection rosters. He’s risen up the depth chart in Winnipeg at lightning pace and his strong play at the World Championships this past summer showed he can stand in against professionals at the international level. It wouldn’t shock me if he winds up as the starter for the tourney. Murray may be a slightly off target selection, but he’s been phenomenal for the Baby Pens, posting insane numbers last year (40 GP, 1.58 GAA, .941 SV%). He hasn’t seen the NHL yet, so he still has some growing to do on that end, but his sterling play in Wilkes-Barre has to have the North American management team talking. Rielly has quickly grown into Toronto’s best defenseman and his strong skating style is winning over fans across the league. He has good numbers through two full NHL seasons and his third is shaping up to be his best yet. I expect Rielly to be one of the minute-eating defenders for the Young Guns. Likely the defacto number-one defenseman on this roster, Jones has lived up to his billing as a lottery pick for the Predators and he’ll see huge minutes as the Young Stars team works to match their veteran counterparts. Like the fellow righty listed above him, Ekblad will likely play a major role on the Young Stars team. He’s shown talent beyond his years in just one season in the league and his size and skill will make him an invaluable piece of the puzzle. A not overly shocking trend with building this roster is the number of top-10 picks who I pulled, Hamilton is no exception. While Hamilton isn’t enjoying a Norris-caliber season with the Flames, expect his experience in the league to play a role in slotting him into a role on the squad. Another big body who has a fair bit of experience in the league. While there will be plenty of greenhorns on this roster, there are a decent number of eligible players who have seen quite a bit of time at the NHL level. Trouba is an excellent example of this, as a guy who has carved out an important role with the Jets. Hanifin’s NHL resume is quite incomplete at the moment but I wouldn’t be surprised if the fifth pick from this year’s draft finds his way onto the team. There’s probably a chance he is sitting on the bubble at the moment as there are a few names who could probably rotate in, but his pedigree likely lands him a spot. Dumba is the last man in for now as he appears to be growing into a fine NHL defender. While I could easily see him swapped for a number of players (Ryan Murray, for example), he’s seen a lot of time at the NHL level, making him a solid choice as the extra defender. There were more shoe-ins for this roster than I originally expected. In fact, I found that there were more forwards to choose from than I thought there would be. McDavid is an obvious choice as you could probably argue that this team was included as a way to showcase McDavid and Jack Eichel, among others. To give you an idea of how much of a sure thing Eichel will be for this team, the Team USA management group asked for a waiver to include him on their main roster. 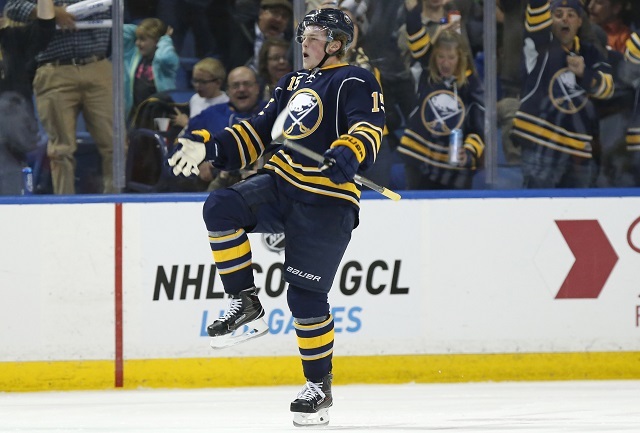 Eichel and McDavid will be the darlings of the Young Stars roster, I’m looking forward to seeing how they contribute. I’m not sure if it’s because the Oilers keep winning the lottery, but it feels like RNH has been around forever. As it turns out he falls under the age limit for the team, giving the Young Stars a player with a bunch of NHL experience who plays a very strong two-way game. He’ll be a major asset. Copy and paste much of the above text for Couturier. He’s been in the league for a while now, but he meets the age requirements for the Young Stars. He’ll be a great addition to a team that could potentially have a need for forwards who excel in the defensive zone. The lottery pick parade is pretty much never-ending with this roster. While the attention will be on McDavid and Eichel, don’t be shocked if MacKinnon winds up as the team’s leading scorer. Another addition of “veteran” presence for the Young Stars. I’m not sure if Saad’s qualification for the Young Stars team means more to them or to the Team USA management group who lose out on a solid scoring winger. Strome is another guy who has been around for a little while and also happens to be supremely talented. I like him as another sneaky option to pile up points for this squad. I looked up Sean Monahan’s birthdate and it said he was young enough to be on this team so I put him on the roster. He was picked high in the draft and plays for the Flames now. Likely another candidate for the US team who fell under the age cut off. I’m interested to see how Galchenyuk is used if he ultimately makes this team. I’m not sure if he’d excel in a checking role but there are so many skilled forwards who will be getting a look on this team. Does he fit with a guy like RNH or would be suit the team better skating with a guy like Strome or MacKinnon. I’m curious to see if a storyline develops (or if it already has) regarding the Young Stars ability to play in a physical game. I think the Americans will likely ice a fairly heavy lineup and you could find two sets of six defenders in Canada who will lean on you for 60 minutes. So having players who can withstand that style will be necessary. Enter Scheifele who isn’t imposing with his size but isn’t a small player either. His improving numbers at the NHL level don’t hurt either. 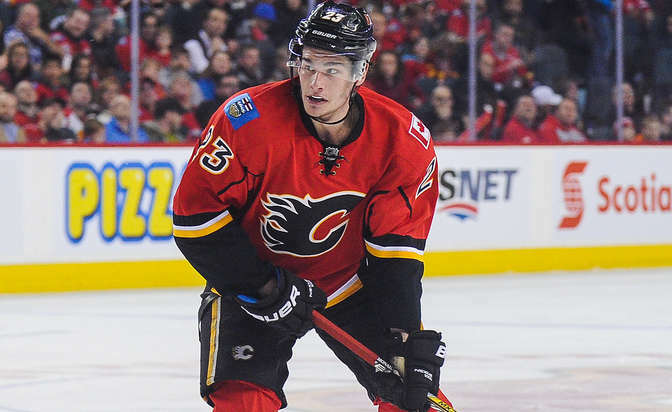 Johnny Hockey might be more of a plug-and-play addition to this squad. Clearly he is going to serve the team better playing in a scoring role, but does he supplant guys like MacKinnon, Strome or Saad? Does he wind up as an extra forward who gets rotated into lines as a game progresses? The overall makeup of the roster will be interesting, but leaving off a player as electric as Gaudreau would be a mistake. Maybe a bit of a question mark only because he’ll be fresh off the stage in Buffalo after the draft, but Matthews is plying his trade in the pro ranks this season and all signs point to him being an instant-impact player at the NHL level. You have to find a spot for him. Larkin and Anthony Duclair were among the first names out when it came to picking an extra forward. You could probably list a dozen names who could fit into this spot. I chose Larkin due to his status as an American hero, his blazing speed and what is shaping up as a very impressive rookie season with the Red Wings. Even with the shortcomings the Young Stars team may have in goal compared to other teams in the tournament, I don’t expect them to struggle to keep up offensively. Their defensive unit will hardly be a weak point and I wouldn’t be shocked to see the Young Stars shock fans and make a push for the medal round.